So you decided to finally get into this whole “blogging” thing – better late than never, right? You’ve selected an eye-catching, user-friendly theme, you’ve optimized all your posts for maximum search engine exposure, and you’ve written dutifully. Before you give up and chalk blogging up to a fad whose time has come, consider these tips (and examples) to get your company blog back on the right track, and start generating real, meaningful interactions with your customers. If you only post a couple of times per month, customers won’t have any serious reason to come back and keep reading. That’s why creating a workable posting schedule is vital to achieving long-term blogging success. Wegman’s blog highlights not only their products, but also ways to be more sustainable and environmentally-friendly, along with easy recipes, how-to tips and entertaining suggestions. 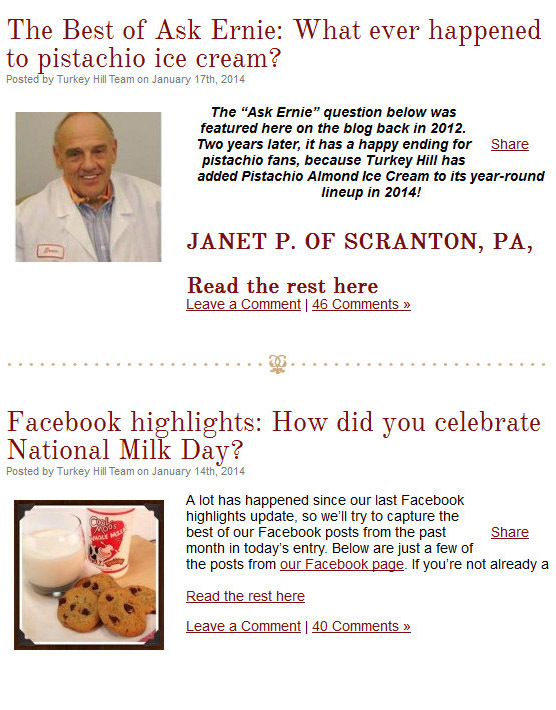 Every couple of days, regular authors post on the site with fresh news and updates that matter to their communities. If you need a little help setting and sticking to a regular schedule when you blog, WordPress’ editorial calendar plugin could be just what you need. You can drag and drop posts to organize them, and edit them from right within the calendar, making it easy to manage a team of guest bloggers or give yourself that reminder kick-in-the-pants that your latest blog post is due tomorrow! One of the most common “buts” that I hear when consulting with bloggers about improving their websites is that they don’t have anything interesting to write about… that their topic is boring. And if you approach it that way – it will be! 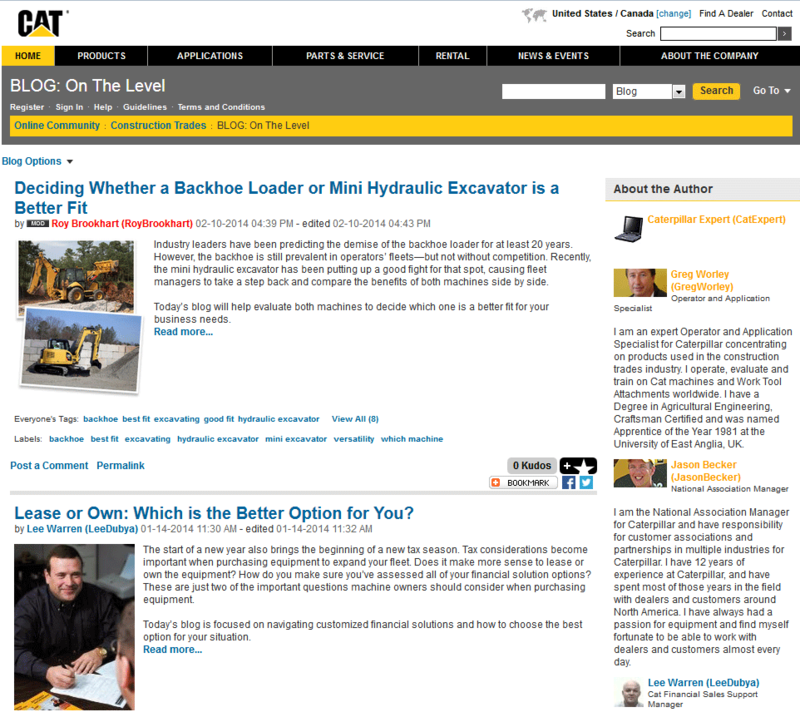 Caterpillar’s blog is set up a bit differently than most, in that it’s a hybrid blog/forum where individual posts are set up like forum threads. Topics range from equipment maintenance in all seasons to areas where Caterpillar’s own products shine – small machines doing big, heavy jobs. There are also management tips, regulations and laws, and even landscaping spotlights – demonstrating that even the most mundane, everyday equipment can have a surprisingly interesting life. Your Topic’s Alphabet Soup – what do all those terms and acronyms stand for anyway? One of the main reasons company blogs fail is that when posts sound like they’re coming from a corporate machine instead of a person, people just don’t participate. There’s no personality, no zest, no fun! 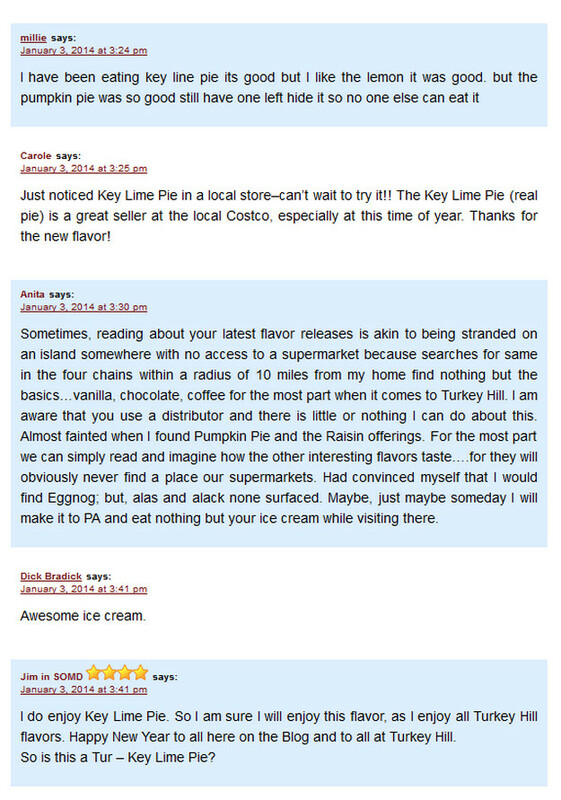 To develop these kinds of comments on your own blog, consider ending your post with a question that gets your visitors thinking or offering their opinion. As you start to get more comments, mention some of the more insightful, thought-provoking ones in your email newsletter – along with a link to the commenter’s site. Chances are, they’ll appreciate the recognition and the spotlight, and may even come back to your post to contribute more thoughts on the topic. Also, don’t forget to remove any obstacles that could be preventing people from commenting in the first place. This includes, in many cases, content management systems which fail to load, or load so slowly that people simply give up and move on. Also, disable the WordPress setting which requires users to register or login before making a comment – most people won’t do it just to say a few words, and if your blog is that plagued by comment spam, there are other plugins along with WordPress’ default Akismet which can reduce it to virtually nothing. Users who follow your blog may not be aware that you’re also active on social media channels (we’re starting to become as blind to social media icons as we are ad banners! 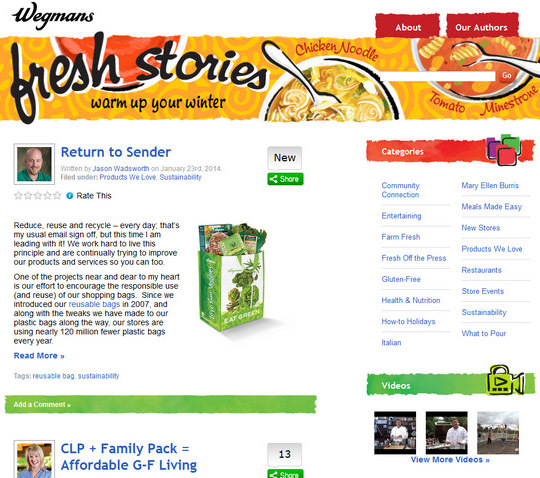 ), so why not give blog readers a teaser of what you’re doing on your social media pages as well? Although the entry is a blog post, it mainly highlights what’s going on over at the company’s Facebook page and invites users to participate and share their thoughts as well. You can incorporate this idea into your own company blog by showing off what you’ve pinned on Pinterest recently, a question you asked on Twitter, and so on. This not only encourages interaction and discussion across all your business social channels, but also gets people talking “beyond the blog”. So there you have it – plenty of ways to salvage your corporate blog and make each post clickworthy and shareworthy instead of digitally stagnating. What are some of your favorite company blogs? Share them below in the comments!